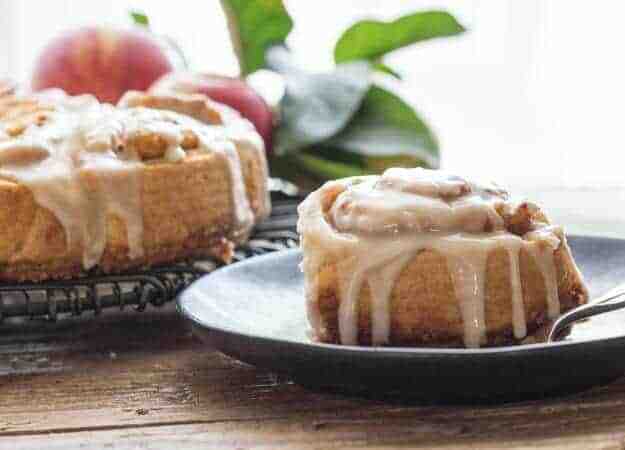 Apple Butter Cinnamon Rolls are the perfect addition to any breakfast. 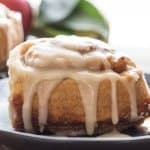 These no yeast Cinnamon Rolls are fast, easy and filled with delicious homemade Apple Butter, then drizzled with a creamy Maple Frosting. The other day I shared my Stove Top Apple Butter which was quite delicious. 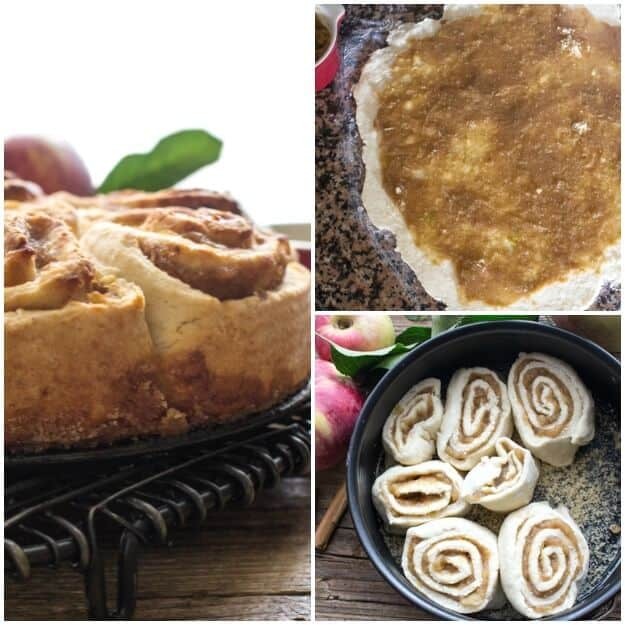 The reason I decided to make Apple Butter was because I wanted to make my Mom’s amazing Brown Sugar Pinwheels and I thought that it would make the perfect filling. 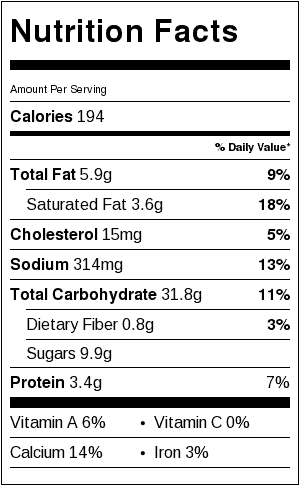 I know a lot of people use it as a dip or as a spread on toast. I actually wanted to make it for the Italian to put on pancakes as a change from Syrup, ah yes the Italian loves his pancakes! The recipe actually made enough for a couple of recipes I have in mind. So I thought this no yeast biscuit dough that my Mom always used for her pinwheels would work perfect with a filling of Apple Butter. These Cinnamon Buns are so fast and easy to make. 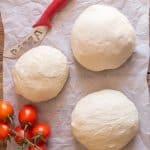 No mixer or food processor needed all mixed together in a large bowl, and then gently kneaded to form a soft dough. You don’t even have to refrigerate it. I rolled out the dough then I spread it with the filling, rolled it up and sliced it. Before placing the rounds in a 7 inch cake pan, I buttered the pan and sprinkled a little brown sugar on the bottom. They were baked in about 30 minutes. While they were cooling I made a delicious Maple Frosting, using some of the Syrup I brought back with me from visiting back home in Canada. If you notice I frosted half. My husband prefers them plain. Save the syrup for the pancakes his is motto! 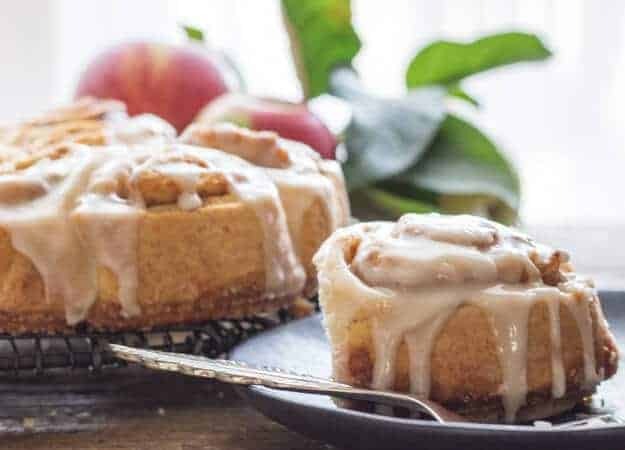 When you are craving a Cinnamon Roll but don’t have the time these Apple Butter Cinnamon Rolls are the perfect solution. Especially when you drizzle them with a little Maple Frosting! Enjoy! 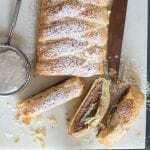 A quick and easy no yeast dough filled with a yummy Apple Butter filling and topped with a creamy Maple Glaze. Pre-heat oven to 350°. 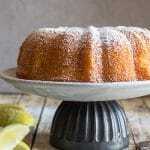 Butter and sprinkle with approximately 2 tablespoons brown sugar a 7 inch cake pan. In a large bowl whisk together flour, baking powder and salt, with a pastry blender cut in butter until it resembles coarse crumbs, add milk and with a fork mix until mixture is almost combined, turn onto a lightly floured surface and knead gently to form a soft dough. 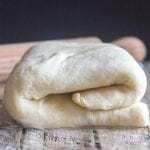 Roll dough out to 1/8 inch thickness. Spread with approximately 3/4 cup Apple Butter or more if needed, roll and cut into 9 rolls, place in prepared cake pan cut side down and bake for approximately 30-40 minutes or until golden, check with a toothpick for doneness. Let cool. In a small bowl combine powdered sugar, vanilla and maple syrup if it is too thick add 1/2 tablespoon of milk, mix until smooth. Drizzle cooled cinnamon rolls with Maple Frosting if desired. Enjoy! I have made my first batch, delicious! Is this a recipe I can make ahead of time, and pop in the oven when I’m ready? If so, do you have any storage ideas? Hi Gwen, so glad you liked it. I think as long as you cover the pan with plastic and refrigerate the dough should be fine. Maybe let it sit for 30 minutes out of the fridge before baking. Hope that helps. Happy New Year. I’m definitely going to make these for my grandchildren. I really like the idea of no yeast in the dough. I’m never comfortable when a recipe calls for yeast. Thanks for another great recipe. These look SO good! 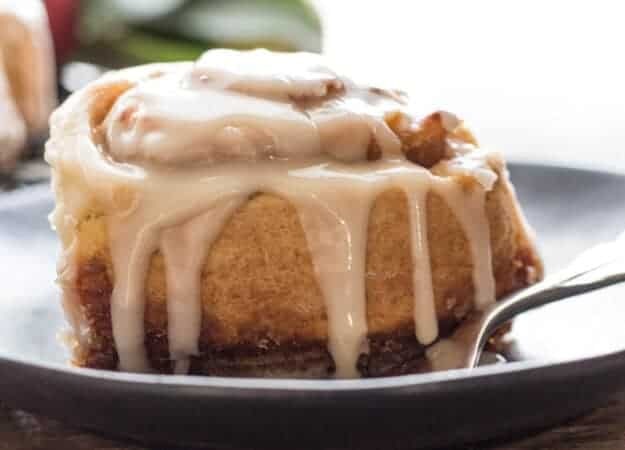 My oldest son loves cinnamon rolls so much, I need to make these for him! Hi Michelle, thanks, hope he enjoys them. 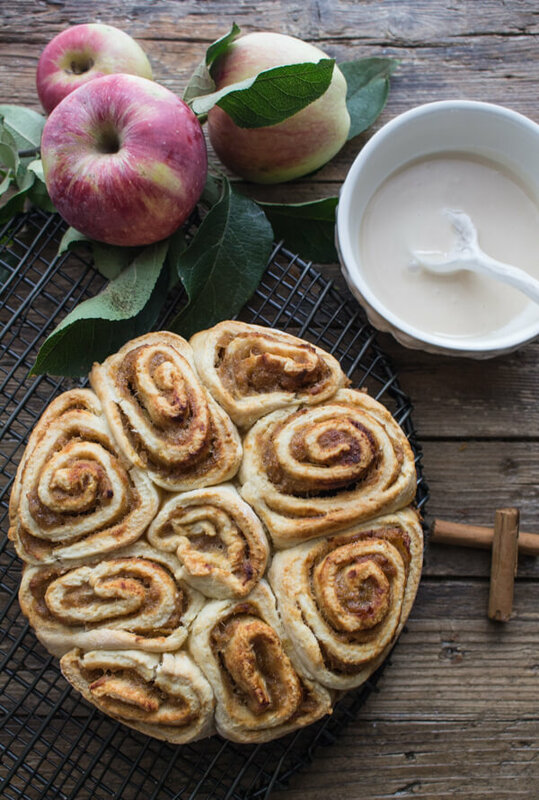 apple and cinnamon a combo made in heaven.. bookmarking this recipe. Thanks for the share. Hi Srividhya, thank you and I totally agree, one of my favourite combinations. I just made salted caramel apple butter–guess what I am using it for? So yummy! Hi Kristen hope you enjoy them, let me know. Have a great weekend.